Feeding America, the largest hunger-relief organization in the United States, announced that its 100 Million Meals Challenge, a partnership with No. 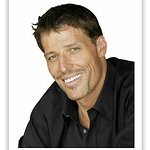 1 bestselling author, philanthropist, and expert life and business strategist Tony Robbins, has changed its name to the 1 Billion Meals Challenge to reflect the campaign’s new goal of helping to provide 1 billion meals by 2025. Launched in 2014, the campaign has so far raised funds to help provide more than 420 million meals to hungry Americans through the Feeding America network of 200 member food banks and 60,000 food pantries and meal programs. Now entering its fifth year, the partnership aims to provide 100 million meals per year to individuals and families struggling with hunger — thanks in part to Robbins’ matching gifts, which have included both personal donations and all proceeds from his two most-recent books: Money Master the Game and Unshakeable. For every dollar raised, Feeding America helps provide at least 10 meals through its network of food banks.